Here I will update with details of my angling experiences, tackle tinkering, fly tying and other trips out into the countryside. So I've not posted much on this blog for the last couple of years and to to prevent kidding myself it's still actually live I'm going to shut down for a while. It may get going again, it may not, I'll just see how it goes. To sign off here are two nice fish taken over the past week or so taken from the Dove. For the past month I've been really enjoying my fly fishing on the rivers again so until next time good bye. There is nothing like the anticipation of the rivers opening for coarse fishing, don't know what it is but the 16th always remains far more special than the opening of the trout season for me. I even managed to fish the evening of opening day having an unplanned escape from work early. So that was on the River Dove where I have had a few sessions over the last few weeks, my confidence was boosted on the first visit by a barbel. I've also had one session on the Trent that was the story of the one that got away. The Dove has been tough and most times I've fished up til 10pm ish to get home at a reasonable hour rahter than fish into the dark, that will come later in the season. This season I also have explored a new stretch a little further upstream than my usual haunts and even caught a barbel on my first visit. This with the one I had on opening night is my return so far, but I will keep trying as you never know and the new stretch certainly looks like it has potential. I've had a couple of trips to Foremark recently as it is a great place to fish once spring arrives. At first it was decidely parky up there where I had to fish hard off the bank to get a fish. Yesterday evening though I fished in ideal buzzer conditions and after a couple of moves found the fish in Bramble Bay where my size 8 olive buzzer seemed to be to the trouts liking. It's a difficult cast in the bay not helped by an onshore wind but that was where the fish were, also not helped by a couple of boats that insisted on anchoring up closest not 15 yards from the bank! You'd think with all that ressie to motor round on they'd find somewhere else but no, quite amusing for me to see his face as I winkled fish out from under their nose. When you stirke it right at Foremark you have to make the most of it and I went home well pleased, nothing quite like that tightening sensation when fishing virtually static. Percentage wise you'd probably see more takes on the bung but for me it is not a pleasant way to fish or even cast a line. The rainbow above has just gone down exceedingly well grilled with garlic and butter, nom nom. The rainbow below was a lovely site coming right after a hail shower! Over the weekend we were stopping on Star bank nr Alton so I had a little sortie down to Ellastone for a couple of hours on Sunday morning. My first vist of the year and it is always nice to be back on one of my favourite spots. Fishing was quite productive with I guess eight or so coming to hand, the water was at a reasonable level and still had a bit of colour in it after the recent rains. All my fish came to a small GRHE nymph, with not a rise to a dry fly. The fish above are now not unusual at Ellastone and there are plenty of theories as to where they come from. Escapes from trout farms or stocking by the Uttoxeter club but that is below Rocester. I've had a few trips up to Foremark just lately and also managed a few outings at the back end of last season. I always enjoy a trip up there as I probably fished more with my Dad at this reservoir than everywhere else put together so many memories and also many blanks!! The last bit is still part of the experience for the banks angler, don't let the rod average of 5 fool you as bank fish are hard won here after the initial stockie bashing. On the subject of averages I look at it this way; rod average 5 so way hay fill yer boots time but there has probably been a lucky angler on a boat fallen on a shoal and had 40 fish. If you do the maths that means somewhere 7 other anglers are blanking and I'll wager 5 or 6 of those are on the bank. You can play the percentage game on ther banks also, perhaps with a fast sink line and a booby but that is not my style prefering to earn my fish 'off the top'. So in preparation last week I'd experimented with a hawthorn pattern, probably another variation on a popular theme. Legs: 4 made from knotted black flexifloss, knotted at mid point. The legs weren't that long, way shorter than you'd tie for a hopper pattern and didn't extend much beyond the bend of the hook. Last night I fished the last few hours and after a while fishing various patterns on either floating or intermediate I saw a fish rise off hut point. As there had not been much movement all evening and I'd disturbed a few hawthorns walking the bank I thought I'd give the new fly a swim. Not too bad a cast largely downwind put most of a WF8F out into the region where I'd seen the fish. Well barely had it settled and the trout took it in a lovely roll over the fly, as you can see from the tail on it this rainbow was in good condition and boy did it go before it saw the net. I don't take many these days but this one was destined for my supper so in the bass it went. That was around 7pm, the wind had dropped right down and not 10 minutes later another fish moved in front of me. That one was having it as well so I was well pleased with my new pattern for it's first outing, hopefully it might account for a few more over the next few weeks now the weather is hopefully warming up. The trout I killed went straight on the barbecue when I got in and made a delightful end to the bank holiday weekend washed down with a dram of Jura. The season is over now and I've been neglecting updating this blog so will try and do a bit of catch up! This trout was one of the prettiest I've seen and it was taken at Darley Dale in September. 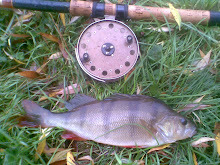 I hope to get out for a few grayling sessions now the winter is here and will have to try harder to update here. I've had a few trip over the last week or so to the Dove and the Derwent and have been lucky enough to find the conditions OK each time. The fishing has been productive but despite it being the height of the mayfly you've had to work for your fish. Prospecting has not really raised many fish and it has been important to find fish on the feed and them cover them and a well presented mayfly pattern has usually met with a positive response. On my trip to the Dove last Sunday I didn't actually cast for the first hour as there was no sign of rising fish, however as a good hatch developed the fish started to move and the air was soon swarming with drakes as can be seen in one of the pics. Phil joined me on this beat and as he stayed a little later really enjoyed the cream of the fishing. The Derwent last Monday afternoon was a similar prospect, with the angler having to first find the fish and then present the fly. This is not the easiest prospect at Darley Dale as the banks are very steep with deep margins so it is extreme wading!! You will also be rewarded for staying low, I took a couple of fish rising close to the bank with a only a few feet of line out of my tip ring but I was nestled nicely into the undergrowth. I finised off the week yesterday evening on the middle Dove and despite being in two minds about the river conditions it was spot on, a lovely level and colour with a constant hatch through the two hours or so I was there. This was real duffers fortnight stuff once the sun dropped and in a short period I took high teens of fish on a variety of patterns. I had a chat with one of the Norbury fly fishers who had celebrated his 40th birthday by taking 40 fish! Not sure how many days we have left of the drake for 2014 as it is now raining heavily and not a brilliant forecast for the rest of the weekend, but I can't complain and have had a good mayfly season this year.